Sometimes, I configure my tablet PC as wifi hotspot to use Internet in my Arch linux desktop. Yesterday, I messed up with wireless network card’s settings, and my hotspot didn’t work. I was able to connect with hostpot, but Internet didn’t work in my Arch Linux desktop. Here, wlp9s0-sktab is my wifi network profile name. I got the following error message while I trying to start the network profile. Job for [email protected]\x2dsktab.service failed because the control process exited with error code. See "systemctl status "[email protected]\\x2dsktab.service"" and "journalctl -xe" for details. 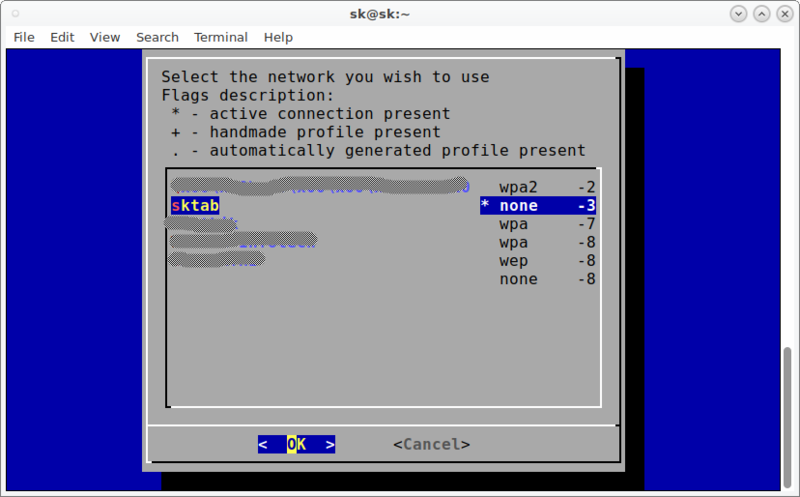 And, created a new one with name “wlp9s0sktab” (without hyphen) using “wifi-menu” command. But, no luck! I still got the same problem, and Internet doesn’t work. I ran the following command to know the status of my wifi network profile. Here, wlp9s0sktab is my wifi hotspot name. Mar 12 12:25:25 sk systemd: Failed to start Automatically generated profile by wifi-menu. Mar 12 12:25:25 sk systemd: [email protected]: Unit entered failed state. Mar 12 12:25:25 sk systemd: [email protected]: Failed with result 'exit-code'.While searching through Arch Wiki, someone has pointed out that we shouldn't hypen (-) in network profile name. So, Have deleted the existing network profile as shown below. I have no idea what I have misconfigured in the network settings. After digging little bit into Arch Linux forums, I found that systemd causes this problem. I was testing and configuring a local DHCP server, so I had enabled dhcpcd.service in systemd. This was the reason why my wifi hotspot refused to work. If you ever encountered this problem, just follow these steps given below to fix it. Next, Remove old DHCP leases. The following directory contains all dhcp leases. Just delete all of them or delete only your preferred dhcp leases. I deleted all DHCP leases of my wif network profiles as shown below. Finally, delete all connected wifi network profiles. As you may know, all network profiles will be found under /etc/netctl/ directory. Once you logged in, create a new network profile for your wifi network. Avoid using hyphen in wifi network names. Click OK to save the profile. Mar 12 13:26:33 sk systemd: Started Automatically generated profile by wifi-menu. Additional note: If Internet still doesn’t work on your system, you need to update the nameserver details in your /etc/resolv.conf file. In my case, I have added 192.168.43.1 as nameserver and Internet worked just fine! What if the dialog showed “Connecting failed” and the status is still “Active: failed” ? Mi idolo, gracias me acabas de sacar de un apuro. Cheers, mate, this was exactly what I needed. Oh man…. thank you so much! You are a saint! I was reading through the docs trying to figure out how to tackle this. Saved me a lot ton of time I’m sure! I’m new to arch so stuff like this can take a while. Thank you so much, that was super helpful! !